This book is published and was very kindly sent to me for review by Michael O’Mara Books. It contains a large number of natural images. Many of these include patterns within them in a zentangle-style to create lots of small spaces that can be coloured over or within to create different effects. There are also a large number of patterned pages — abstract images, repeating designs, crazy shapes and more. 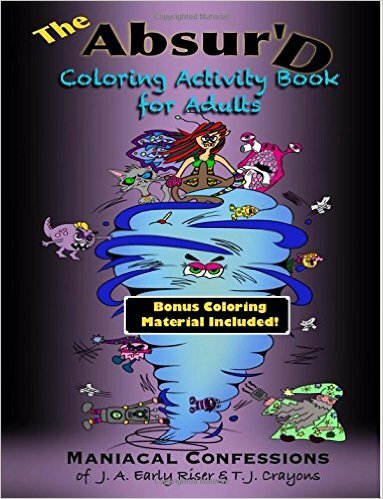 If you liked Color Me Calm and Color Me Happy then you’re sure to love this book because it contains illustrations from Angela Porter, who illustrated both of them. Her style is very unique and striking with its flowing scenes; you can’t quite tell whether they’re scenery or just abstract shapes. The natural images include dolphins, birds, flowers, mountains, stars, peacocks and so much more. 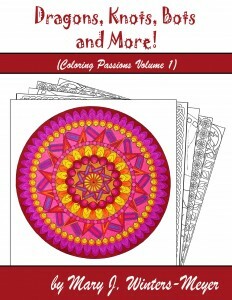 This book is a great all-rounder and perfect for beginners who want to try a bit of everything, or anyone who enjoys colouring a huge variety of designs. The line thickness ranges from thin to medium/thick and mostly resides within the medium range. This is a good book for those of you who struggle a little with fine motor control or who don’t have perfect vision, but still want to be able to colour some fairly intricate and detailed images. This is a lovely book, perfect for practicing mindfulness. The details force you to concentrate; this can be used as a great distraction technique when you’re feeling anxious or low and really need to get out of your own head. The image above was coloured using Stabilo .88 fineliners and Staedtler Triplus fineliners which did both bleed a little through the page. The Art of Mindfulness series is currently a set of 4, differently titled books, each containing almost 100 images, illustrated by various artists. The books are slightly smaller than A4 size, paperback and glue-bound. All of the images have a 1cm border around them, so none are lost into the spine. The paper is bright white and thin. Sadly, it does bleed when using water-based pens. There isn’t a lot of tooth, but it isn’t completely smooth, so you can blend and shade a little with coloured pencils. 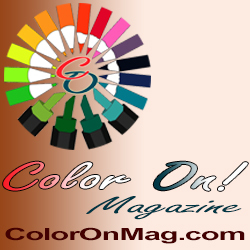 The designs are printed double-sided, so you will need to be careful about what mediums you use to colour with, or make copies before coloring. The line work in each book varies from very thin to medium thickness, so this series isn’t great for those of you with poor vision or fine motor control. This is as you’d expect from mindfulness-themed books, since they require concentration. The images in the books vary in theme, but are mostly abstract designs and natural imagery of things like plants, flowers, weather, scenery etc. All of the books are very pretty. They are ideal for people who are mentally ill or wanting to practice mindfulness. There are lots of intricate and detailed images to focus your attention on, so you’re distracted from your low and anxious thoughts. You can be in the here and now. As far as books with a huge variety of images go, these are definitely some of the best I’ve seen. They’re all very different from each other, but also feel similar enough to be a cohesive series.